This name uses Spanish naming customs: the first or paternal family name is Pastor and the second or maternal family name is Julián. Ana María Pastor Julián (born 11 November 1957) is a Spanish politician for the People's Party who has been President of the Congress of Deputies since 19 July 2016. Previously she was Minister of Health from 2002 to 2004 and Minister of Public Works from 2011 to 2016. Ana Pastor Julián was born in Cubillos del Pan, Zamora, she has a degree in Medicine and Surgery from the University of Salamanca and was an officer of the Senior Public Health and Health Administration. She has been Head of Health Service Planning of the delegation of provincial council of Pontevedra of Minister of Health of the Xunta de Galicia (Galician Government), and primary care manager in the province of Pontevedra and provincial council director of the Galician Health Service, SERGAS (Galician Health Service). She was general director of the General Mutual State Civil Servants (Muface). In the People's Party XV Congress she was elected executive secretary of Social Policy. She also became the coordinator of Social Participation of the party. 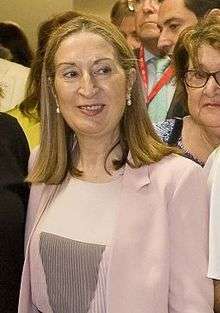 She has represented Pontevedra Province in the Spanish Congress of Deputies since 2000, becoming second vice president of the Bureau of the Congress of Deputies until 13 December 2011. On 22 December 2011, she was appointed Minister of Public Works and Transport of Spain. On 18 July 2016 Pastor was designated by Mariano Rajoy as the People's Party candidate for President of Congress, with the support of Citizens. As speaker, she heads the lower house's nine-member executive committee. Ana Pastor Julián has been a patroness of Foundation for Analysis and Social Studies (FAES). ↑ PP (1 May 2009). "Ana Pastor pide al Gobierno un Plan de Respuesta Común contra la gripe A". Retrieved 15 November 2010. ↑ Amanda Cooper (19 July 2016), Spain's Rajoy strikes deal on house speaker though deadlock drags on Reuters.